The other day when I was on one of my morning runs I spotted the cutest bunny rabbit. The rabbit did not seem to be bothered by presence. It let me get really close before it finally hopped away. Spotting the cute bunny made me smile. It put a “spring” step into the rest of my run. When I got home I decided that I was going to craft a cute bunny for my mantle. 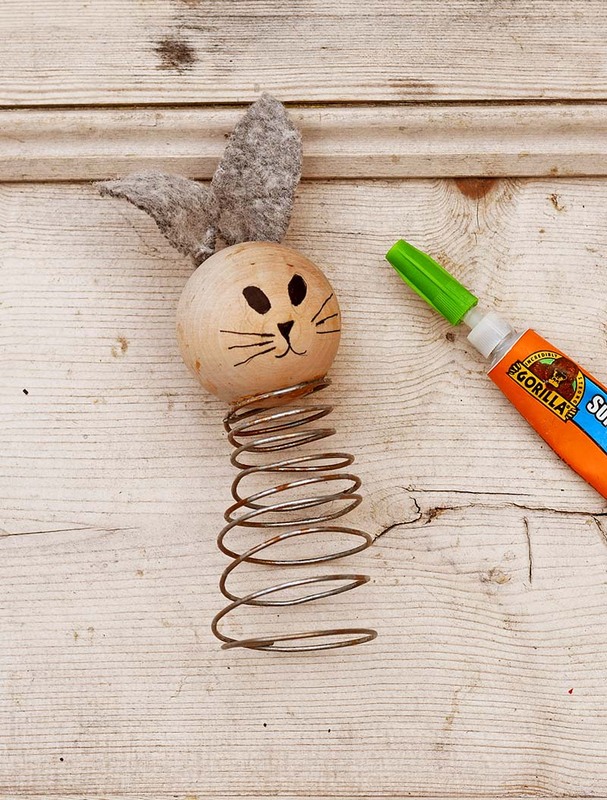 As with most of the crafts I make, I wanted to make the spring bunny out of stuff I already had. I spotted a lovely old rusty bed spring and thought that would make a great body. I went hunting for a wooden ball to use as a head. Unfortunately, the bed spring was far too big for the wooden ball. That’s when I decided to make a spring to size. I just used some old wire I had lying around in the garden. The recycled little spring bunny turned out great. He has a bit of a rustic farmhouse vibe about him, as he’s predominantly made from upcycled materials. 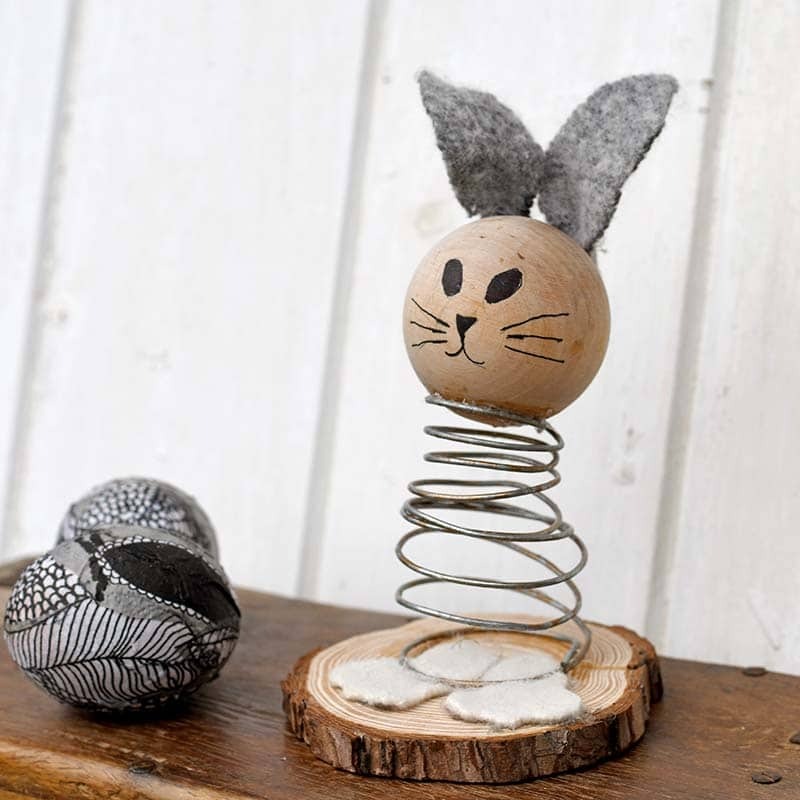 I’m still on the hunt for a bigger wooden ball to make another spring bunny. 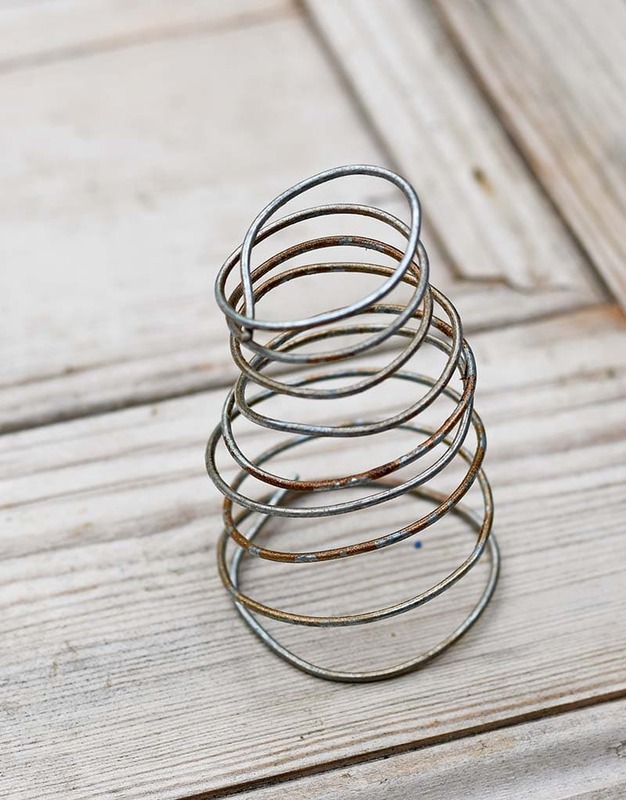 This time with the rusty bed spring. Sometimes you can get large wooden balls that have been used to top newel posts. Old spring or wire to make one. 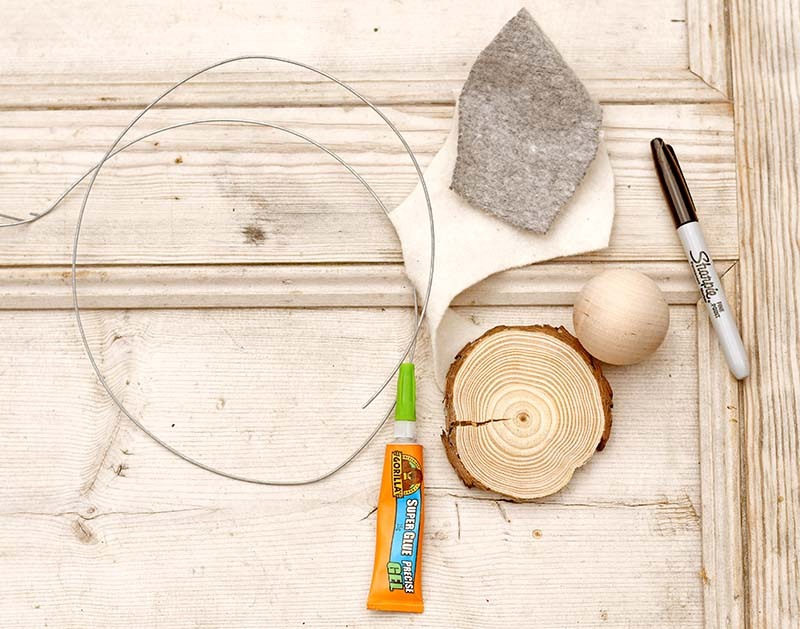 You could even use a wire coat hanger. 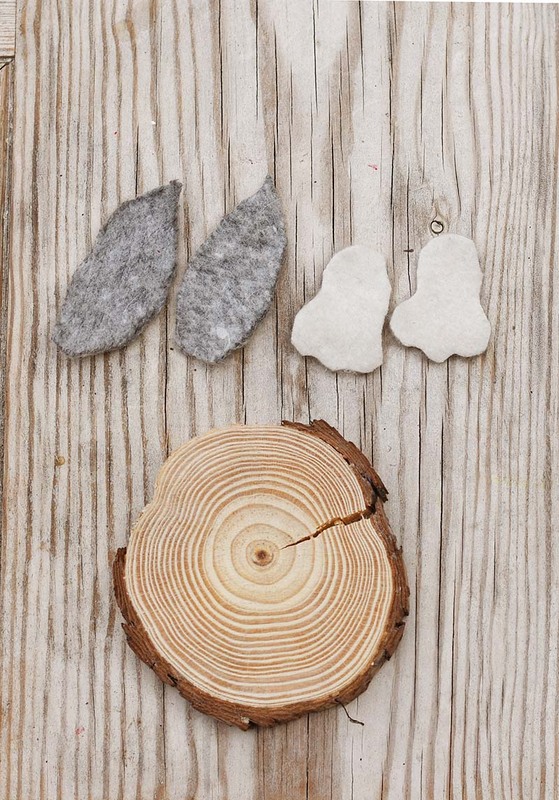 Scrap pieces of felt in grey and cream. I used some sweater felt scraps that I had left over from other upcycles. The first thing to do is to make a spring if you don’t have one the right size. I used the neck of a large beer bottle for this. As I wanted a tapered spring. 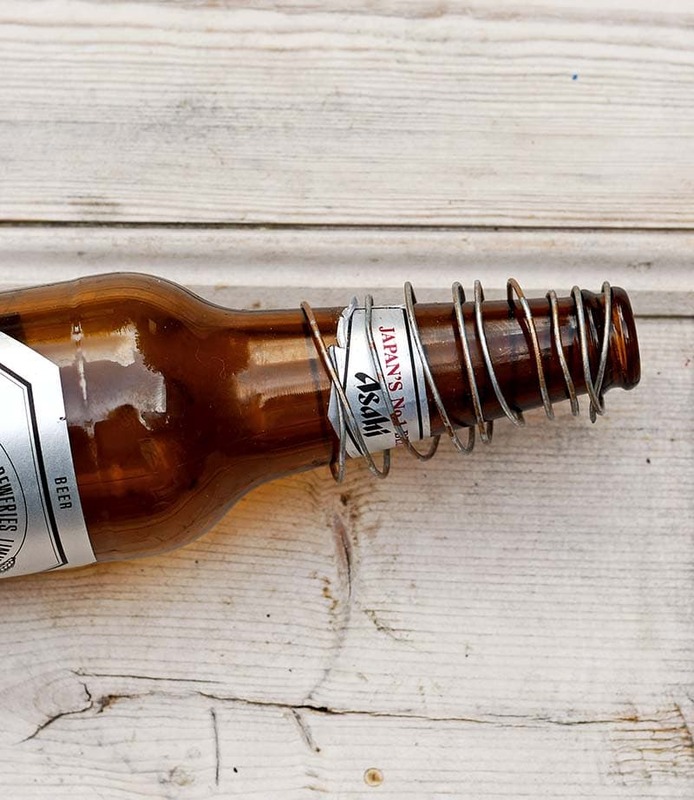 Simply wrap the wire tightly round the neck of the bottle to make the spring. 2. The next thing to do is to cut out bunny ears from the grey felt and bunny feet from the cream felt. 3. 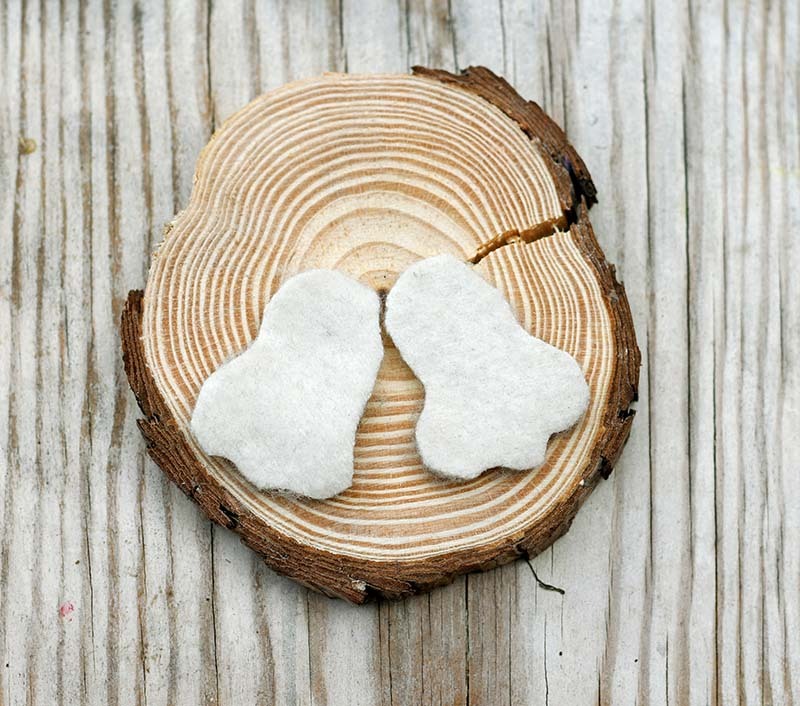 Then, glue the feet to the wood slice for the base of the bunny spring. Like in the picture below. 4. 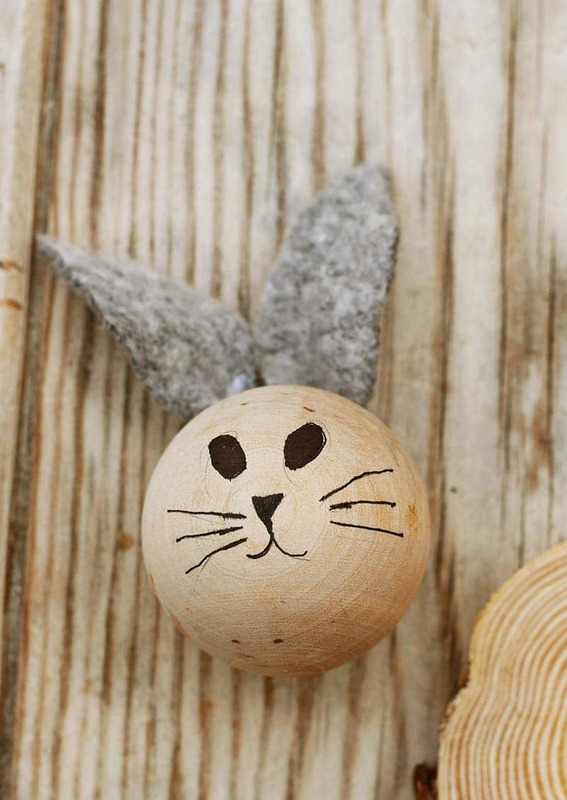 Then draw the bunny face onto the wooden ball using a black sharpie. If you are not confident with your drawing ability, you can draw the face in pencil first. Then when you are happy with the face to go over the pencil lines with the permanent marker. Finish, off the head by gluing on the bunny ears. 5. Finally, using the super glue gel, glue the wooden ball head to the spring. Then, glue the spring to the wood slice base. This spring bunny is a great addition to my mantle. I can’t resist giving him a little nudge every time I walk. His little head wobbles for a while on the end of the spring. A bit like those nodding dogs people used to have in the back of their cars. 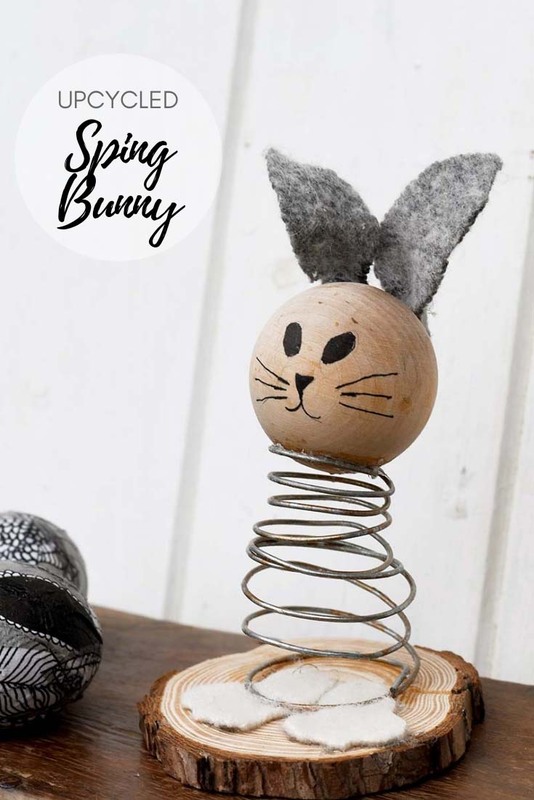 I can’t wait to make another one of these spring bunnies with the large bedspring I have. I keep on checking skips/dumpsters for a round wooden topper from a newel post. Hopefully, I’ll find one soon. Where I live the streets are full of old Victorian houses and there are always a few in each street being renovated. If you like this you may want to check out my other upcycled spring crafts. 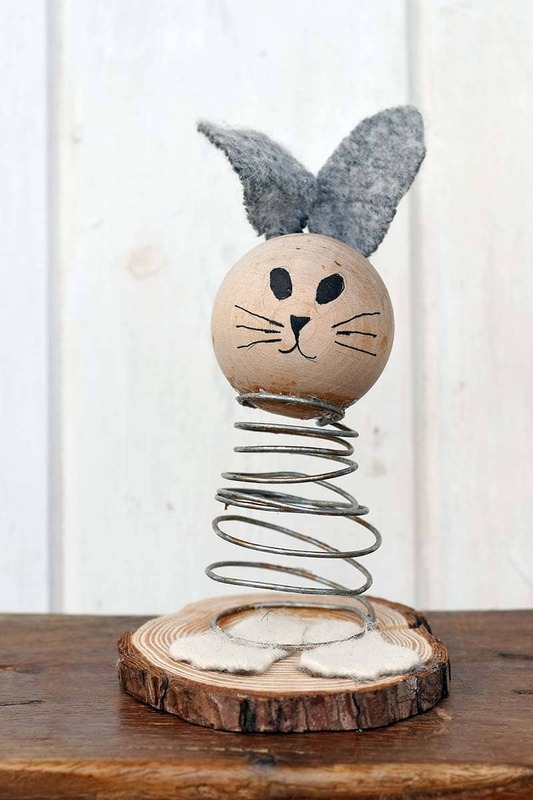 I just love your upcycled spring bunny, he is just too cute! Thank you so much for sharing at Celebrate Your Story! I will be featuring your post when we go live Monday evening at 7:00 p.m. CST. I do hope you will share with us again! Hugs! Thank you, that’s great news I look forward to seeing it. Such a cute craft – and beyond adorable! You were one of my features at Best of the Weekend this week! Thanks for joining us! Aww, that’s awesome thank you I look forward to seeing it. What a great use for an old spring! Your bunny is adorable. Thank you so much. He does look very cute on the mantle. He’s very sweet. I wonder if a ball from a kids garden game would work for your bed spring? Maybe a croquet ball or an old wooden boules set, something like that. Or even a cricket ball? Not sure you’d want a bunny with a red face though….. Thank you. You could always paint the ball. This is so cute! My daughter would love it, and it would be a great craft for her to help with. She’s always picking things up and talking about “upcycling” them. Ha! Wonder where she got that from… Thanks so much for sharing at Sweet Inspiration! Thank you. My nephew loves to upcycle and collects junk. I never thought about creating my own ‘vintage-look’ spring! Great inspiration and such a cute bunny! Pinned! Thank you. I just couldn’t resist making him. This is absolutely adorable! I love it! Thank you so much for sharing at Celebrate Your Story! Have a great day! Thank you. I think big paper floppy ears will look great. A fabulous bunny, Claire! thanks for sharing on craft schooling sunday! Thank you kippi. I try to use the things around me whenever possible. What a fun little bunny! I was just looking at one of my springs yesterday thinking what I could make for Easter. He’s a cutie! Thank you so much. You should give it ago, he was very easy to make. Thank you. I’ve got an even bigger rustier spring just looking for the right head. Thank you, Michelle. He does look sweet on the mantle. Such a fun idea. So cute! Thank you, Kristi. He was so fun to make I think I will make him a friend too!